« What’s in your overlaps? 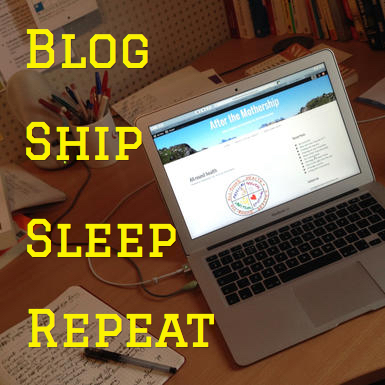 A few months ago I decided to start a new blog called After the Mothership, aimed at people who have finished a substantial corporate career and are having to adapt to life outside that environment. An irregular blogger for nearly 6 years, I had never got into a habit. Now I needed to build up a body of content quickly. This was going to be different. I started writing on most days but I only published a few blogs in each of the first two months. I was concerned about what I was writing, I felt it was too personal and that people would judge me. I was also worried that if I blogged too often people would miss the gems that I was writing or they would get fed up with me flooding them with content and repeating myself. This is what Stephen Pressfield calls the resistance, the millions of different ways our minds sabotages us and stops us from sharing our work with the world. There’s only one way to get through this and that is to publish, to ship your work. So, in November, I decided I was going to try to publish a blog every day (excluding weekends). I published 17 blogs in the month, not quite every day but pretty close. I wrote every day and so I ended up with another 20 blogs in draft form. This was the most intense period of content writing for me and definitely the most consistent period of shipping. There have been a few useful learnings from this experience. Firstly, I got a great sense of achievement by shipping something on a regular basis. It doesn’t matter if no-one reads it, I have a great sense of accomplishment from doing the work and it has done wonders for my self-esteem. Also, by focusing on the process of writing and shipping I avoided getting overwhelmed by the goal of creating a good, well-read blog site. I also got to really focus on what I was writing about. I have a millions things and experiences I want to share but they were a bit all over the place in my head. Writing regularly has helped me pull it into shape, sort the wheat from the chaff and sharpen up my thinking. I have created a voice for myself, a style of writing that sounds like me. I have learnt to blend just enough personal experience with the underlying science and knowledge to keep it interesting. I feel much more confident about how I talk about these subjects. I have developed a process for writing and shipping my blogs. This saves time and mental effort that I can focus on what I want to say. I learnt that it’s best to have a picture with each blog because it looks much better when you share it on Facebook, LinkedIn and Twitter but finding a suitable picture was taking more time than writing the blog. My solution? I make my own, fulfilling a personal commitment to do more art as a way of enhancing my wellbeing. OK, I am a bit crap right now but I will get better and I now have that bit of the process under my control. It has also changed my perceptions of what I am capable of. I have become a better, faster writer and my understanding of myself has grown, as well as of my subject matter. I have rediscovered the joy of writing, as well as drawing and colouring. Of course, I knew all these benefits were possible. Seth Godin is always telling us to ‘Just Ship’. My good friend Bernie Mitchell has been extolling the virtues to blogging to me (and anyone else within earshot) for several years now. However, you never truly believe until you experience it. Having achieved my objective of creating a substantial body of content, I cut back on shipping every day and am now aiming for 3 a week. Blogging is now a habit and so is writing (I use 750words.com for this). More importantly, shipping is now a habit, one that I can apply to other areas and objectives. I have beaten the resistance (for now, at least). These are habits I urge you to try. You’ll be surprised at what you get out of them. (And if you are frightened you won’t be able to think of things to write, check out this advice on overcoming writer’s block from Seth Godin).